LINCS had the pleasure of welcoming back Cathy Pearson this September, following her visit in May during the CIUTI conference. This time, Cathy was visiting the department with her SCIC trainer cap on, as our application for pedagogical assistance from the EU Directorate General for Interpretation (also known as “SCIC”) was successful. The European Union is the largest employer in the world for conference interpreters, and DGI SCIC has a long-standing commitment to cooperating with top conference interpreting training universities across Europe and beyond through a range of initiatives. 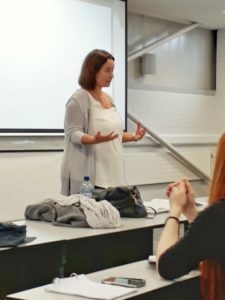 Pedagogical Assistance is one of them, and as such, DGI SCIC send EU professional interpreters and trainers like Cathy to partner universities in order to support the training of students at different stages. Cathy is an experienced conference interpreter and trainer, who has worked across the EU and the world for the English booth, interpreting for prestigious EU summits or supporting training programmes in many conference interpreting higher institutions. As our MSc students are, for the most part, just starting to acquire the core skills they need to become interpreters, the focus of this visit has been on note-taking for interpreting purposes. Cathy delivered a masterclass, which was also open to our M.A. students returning from their year abroad, and keen to revisit the training they already had in 2nd year for this essential skill. Note-taking may sound like something all students should have mastered by their final year, but in fact, the type of notes interpreters take is completely different from what you would use during a lecture. Interpreters must develop excellent instant analytical skills and only use notes to prompt their short-term memory, as their attention has to be on active listening. Therefore, they need to develop a quick, efficient and sparing note-taking system they can rely on to faithfully re-do the speech they heard in a given language. The masterclass included demonstrations and practical exercises, which were explored further in workshops with MSc students. To complement this intensive practice, Cathy also gave a very insightful and focused talk on the pathway to become an EU interpreter (facebook live video available on the LINCS page). In this session, she highlighted what students should focus on to achieve their professional goal, stressing that they must, first and foremost, have a perfect command of their mother-tongue, since it is the language into which an interpreter would work the most. She also provided detailed information on the recruitment process and language combinations sought after by the EU at the moment, and showed the excellent resources developed by the EU for trainees and applicants who have been invited to take the pre-selection and accreditation test. This was a particular point of interest to alumni currently going through this recruitment process. But Cathy’s visit is only the starting point of our programme of training initiatives in partnership with SCIC this year: students will also be able to benefit from further guidance from EU interpreter through virtual classes, with the first of these sessions taking place at the start of October. For more information on our MA programmes in conference interpreting, click here. To find out about our MSc conference interpreting programmes, click here. This entry was posted in Uncategorized by Owen Harrington Fernandez. Bookmark the permalink.